Last week was super fun because we celebrated National Food Day on October 24. It was a great day that started off with our Walking School Buses at Robinson Elementary School (East Lake) and Hemphill Elementary (West End). Each kid got an apple (thanks to Whole Foods Market) and some fun worksheets that highlighted different kinds of vegetables and fruit. In East Lake, PEER, Inc (friend and partner) showed up in the East Lake Farmers Market Mobile Market (which I will talk about in a later post). 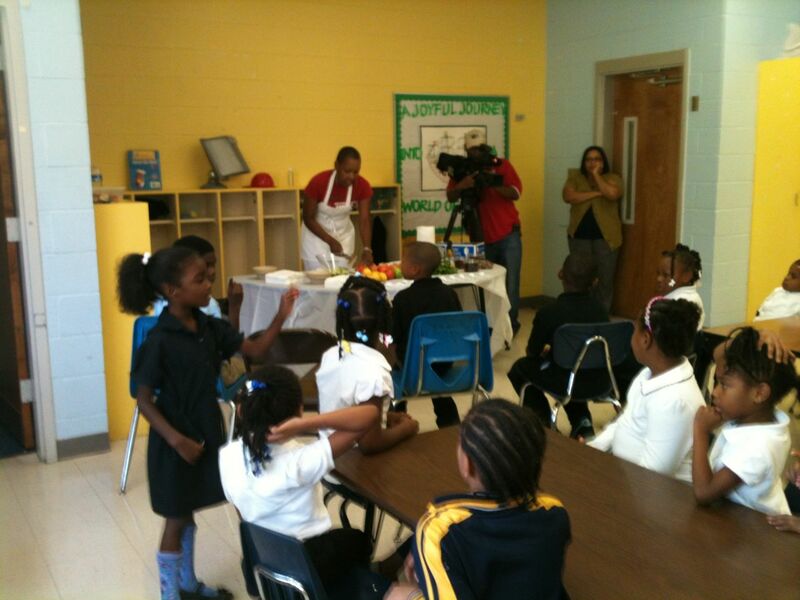 In West End, WE Community Gardens (friend and partner), set up the After School Market as they normally do on Wednesdays, but Ama Shambulia (WE Community Gardens Director) also gave a cooking demo to the second graders. I’d say that her Apple Salad was a huge hit. Our friends at Minority Health & Health Disparities Research Center also celebrated Food Day at HealthSmart. As you can see, it was a full day but I am predicting next year will be even bigger. Hope y’all will join us!